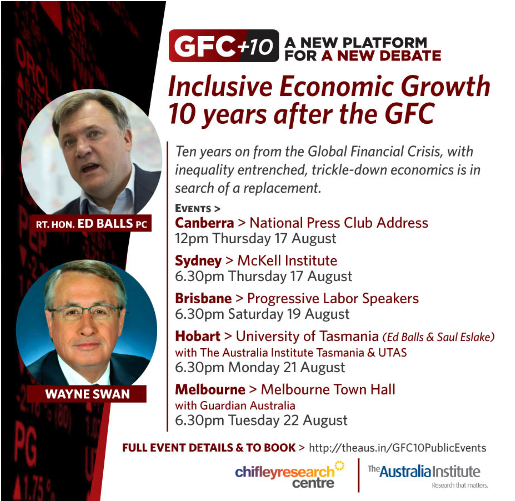 In August 2017, Ed joined Wayne Swan MP for a speaking tour of Australia to discuss the issue of inclusive economic growth ten years after the Global Financial Crisis. "Ten years ago we had the Global Financial Crisis, which Wayne has already talked about, and which unleashed a period of slow growth, stagnation in wages and rising inequality – not just in Britain, but in America and many developed countries. And it has spawned a negative political reaction to politics and to politicians resulting in political instability and uncertainty and some of the unexpected events I referred to earlier, not least the Referendum defeat which we saw in Britain last year over our membership of the European Union. "It’s been a very difficult and destabilising time and the effects of the crisis continue to challenge us. And as Wayne says, it is important that we learn the right lessons. I believe he is right that we learn by challenging our assumptions. Wayne asked ‘what were the things I thought about the world, and where were those assumptions wrong?’ I’m going to take up Wayne’s challenge and try to prove that I can learn and am not one of his charlatans. "There was three different assumptions I had about how the world works when I came and studied the Australian economy in the early 1990s – assumptions which were shared not just by progressive governments but by many politicians of left and right – about how our economies worked throughout the 90s and the 2000s before the financial crisis. "Assumption one was that the main source of instability in our economies came from governments making mistakes – too much inflation, too much deficit spending – and that if you had a sound approach to monetary policy and got your fiscal policy right that was the best way to ensure stability in the economy. The second assumption we had was that, with globalisation accelerating but also with technological change, our challenge was going to be stopping people on the lowest incomes, people with lower skills, falling behind – that most people in the middle would be better off, but the unskilled would fall behind in this world of new technology. And third, that globalisation, which in the 1970s had been about the movement of money around the world, was going to be about the movement of goods – that trade would be challenging because companies would move their production from Britain or America or Australian to India or China, and the issue was how would we deal with that off-shoring. "I believe that the political reaction in the last 10 years, which we are still dealing, comes from our misunderstanding of all of those three assumptions. First of all, and most simply, we had a global financial crisis at a time of low inflation and relatively low national debt. We were all pursuing pretty sound monetary and fiscal policy and we didn’t see the instability which came out of the financial sector in American and also around the world. We didn’t see that it was regulation and the lack of tough regulation which would be the source of instability rather than inflation or fiscal mistakes. The consequence of that was a Global Financial Crisis..."
Read Ed's full speech at the Australian NPC here. You can also watch his talk in Brisbane here. One of the stranger experiences you can have as a Treasury minister is engaging in a tense discussion with the governor of the Bank of England about a problem that does not exist. My contretemps with the governor came during a three-hour meeting in early 2007, as we decided what action to take to tackle a purely theoretical banking crisis at the end of a 10-day simulation exercise. As the UK’s financial services minister, I had decided that we should conduct that exercise to test our systems. Little did we know that the real thing was just around the corner. If Bank of England officials are holding similar drills today — and I hope they are — they will not struggle for plausible scenarios. In the past year, fears of tighter US monetary policy have triggered enough jitters in the equity and commodity markets to warrant the simulation of a full-blown transatlantic stock market correction. Set aside the crisis engulfing Greece. Officials could wrestle with the impact of a sharp slowdown in China or Brazil, or a further escalation of hostilities in eastern Europe or the Middle East. If they wanted to look at a narrower market that is worryingly overheated, they would be spoilt for choice — from London housing to subprime US car loans. If they wanted to try out a scenario similar to the 2007 crisis, they might look beyond the formal banking sector, where rules are now much tougher, and focus on the frothier end of asset management and shadow banking. In retrospect, the current economic situation — apparently healthy growth but with plenty of downside risks — contains some disconcerting echoes of the situation in 2006, a year before the global financial crisis began. Back then, with inflation and interest rates historically low, the consensus was that economies were still recovering from the oil and dotcom shocks of the early 2000s. Economists debated whether continued loose monetary policy was necessary to maintain that recovery, or whether it was simply serving to fuel the next, bigger crisis. But in both the US and UK, central banks were inclined to believe the “great moderation” was delivering a more benign cycle, with lower household savings the result. In retrospect, the current economic situation — apparently healthy growth but with plenty of downside risks — contains some disconcerting echoes of the situation in 2006 While at the time, I remember spending hours in the European Council listening to the German finance minister lecturing Britain about “irresponsible” hedge funds, even while German banks were falling over themselves to buy US subprime mortgages and Greek debt. It was in that uncertain environment that I decided to initiate our simulation. It envisaged a lender collapsing after an unexpected legal ruling, and a large UK clearing bank being exposed to huge liabilities as a result, turning a local difficulty into a systemic event. The simulation ended with my tough meeting with the governor of the Bank of England and the chairman of the Financial Services Authority. 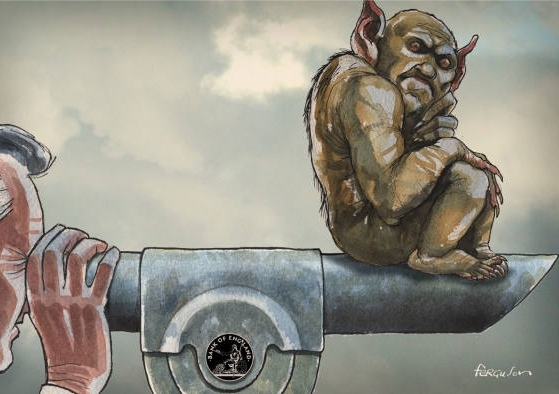 We debated the risk that stepping in might send the wrong message and encourage recklessness by signalling that institutions could expect rescue if they ended up on the rocks. But we decided that the failure of a clearing bank would cause immense damage. So we opted to arrange a takeover. When the real crisis struck later in the year, it did help that officials had been through that simulation — although I know many of the same arguments resurfaced. Here are three long-term lessons, relevant today, that I learnt from that exercise. First, if weaknesses are exposed, they must be fixed quickly. Our simulation at the start of 2007 revealed that our deposit insurance system was old and creaking, and that EU state aid rules could obstruct decisive action to find an acquiring bank. The Treasury agreed a plan with the BoE to sort out those problems. But only on an 18-month timetable — too slow to help when Northern Rock foundered eight months later. Fortunately, the structural reforms recommended by the international Financial Stability Board are happening much more urgently, particularly in the UK. Second, ‎procedures really matter. Even in a simulation exercise, our three-hour meeting was arduous. It helped greatly that there were three institutions in the room, able to debate the issues and hammer out an agreement. Of course, the tripartite system did not spot the real crisis coming. Almost nobody did. But I am concerned that, under the new arrangements which replaced that system, the equivalent discussion would now take place exclusively within the Bank of England, with just one principal at the top. In my view, the head of the Prudential Regulation Authority must also have a direct line to the chancellor, underpinned by proper structures for crisis decision-making which currently do not exist. My third lesson is that sometimes the biggest potential crises are staring you in the face. In our simulation, the lending institution that collapsed was, in fact, a northern building society. And when a buyer was needed for the large clearing bank, who did the FSA propose? ABN Amro. Just a few months later, we were still taken by surprise when Northern Rock collapsed for real; while the misplaced confidence in ABN Amro’s stability was doubtless one of the reasons Royal Bank of Scotland was allowed to go ahead with its disastrous takeover. Policymakers need to be alive to all the distant threats to stability, from emerging market slowdowns to new financial activities beyond their regulatory reach, as they make the difficult and delicate judgment about whether and when to tighten monetary policy. But, while continuing to scan the horizon, they must always keep one careful eye on what is going on at the end of their nose. See the original FT article here.